Don’t just read what we say, take a look at what our previous guests thought about The Quarters. 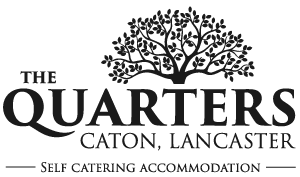 Your accommodation in picturesque Caton is wonderful not least because of its accessible bath and the excellent pub nearby. However its real jewel is the access to the cycle path, which runs alongside the river lune and gives further access to the National Cycle Route network. On our visit using our electric wheelchair trike and mobility scooter, we travelled to Morecambe, Glasson Dock and along the canal towards Preston – all on traffic free paths! A great location for people with limited mobility to get out and about. We had the good luck to find this lovely apartment at short notice to help round off a holiday experience we had planned for years. It was a brilliant way to make our final few days holiday another wonderful experience before having to return home. The apartment was very equipped and comfortable and a real home from home. We would never feel any part of the year would be a problem staying in this cosy apartment, and Sue & Ray made us and our two Labradors very welcome. Plenty to see and do in the area from lovely walks along the River Lune or Moors or even down to Morecambe beach. Plenty of amenities all at hand in within walking distance and also a choice of “watering” holes within walking distance if you fancy eating out or having a friendly drinks. We are only sorry we could not stay longer, and would recommend this apartment to anyone no matter what their circumstances. Sue & Ray have made a lovely apartment for all to enjoy and relax in, no matter what age you are and indeed the fact we could take our two dogs and they could enjoy their stay was brilliant. Wishing to visit relatives in the area, we were looking for a place to stay. This ticked all the boxes for us when viewing it online. When we arrived it was great to see it exceeded our expectations. The owners have put a lot of effort into making guests feel welcome and the little touches (like providing detergent for the washing machine) made our stay even better. The next time we are planning to be in the area we will look to stay here again. The place was nice and clean. The owners were very friendly, welcoming us and flexible to our needs. It was also great value for money and is only 10 minute drive to Lancaster. We would definitely stay again. Thanks.